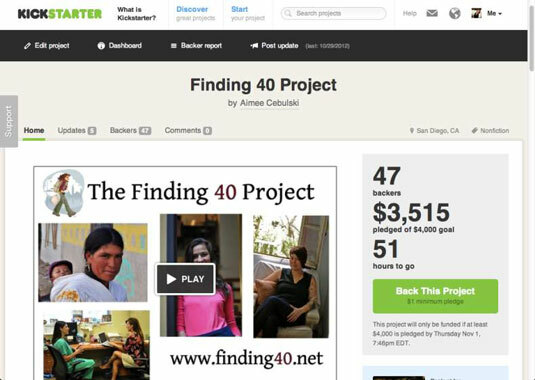 One of Kickstarter’s best features is the ability to quickly review how many backers you have, how much money they’ve pledged, and what reward each has selected. As your project continues, be sure to log in to your Kickstarter account every day and view your current Backer Report and status. Go to the main Kickstarter web page and click the Me icon at the top — it should also have your profile picture. Or if you’re not logged in, then log in first. Click your launched project name. Your project page appears. Here you see how many backers you have, how much money you’ve raised, and how much time is left to reach your fundraising goal. 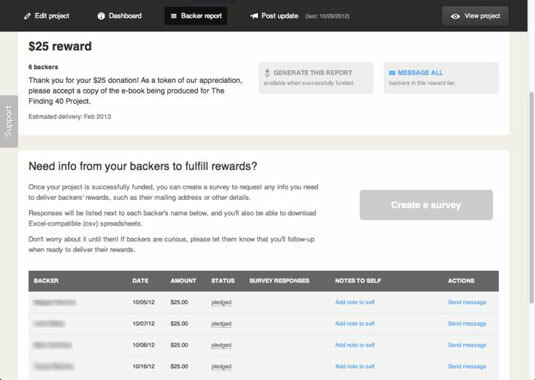 At the top of the screen, you see several options — including Edit Project, Dashboard, Backer Report, and Post Update. Click Backer Report to view your project’s backers. 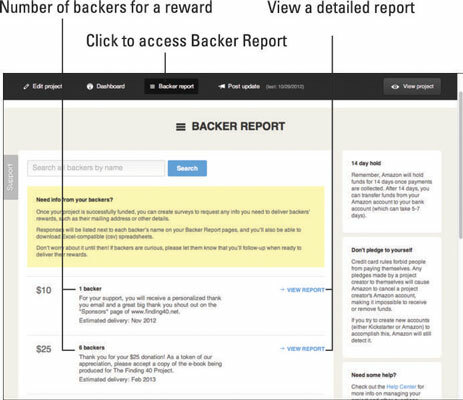 At this screen you see a list of the number of backers in each reward category per the guidelines you set up on your project. To see actual individual backers, click the View Report arrow to the right of each backer level. A sample Backer Report at the $25 level for a project shows the individual backers listed, date, and status for each one. In February 2013, Kickstarter launched an iPhone App available through the App Store. If you have an iPhone, this is a great tool for tracking your backers while you’re on the go. If you have a different kind of smartphone, you can probably find a similar app for your mobile operating system.